Ninfa’s was a chain in the Houston area run by the Ninfa family, there food was always so tasty, and it is a shame that they are not around any longer. Thankfully you can still taste food that tastes just like theirs did. 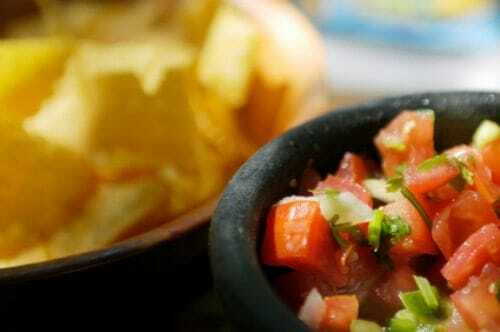 Ninfa’s has been known for their super fresh salsa. This is easy to prepare, and tastes so good. This has a peak shelf life of about a day and a half and you must serve or refrigerate immediately after preparing. You can make a bowl of Ninfa's classic hot sauce at home. Preheat oven to 400 degrees. Place cored whole tomatoes and whole jalapenos in shallow pan, (a cookie sheet with sides) single layer and roast for 30 minutes until tomatoes and jalapenos are charred (they will be black, but that is what takes away the acidity and gives the roasted flavor, you don't have to turn them). While tomatoes and jalapenos are roasting, saute the onion in hot oil (vegetable, olive or lard) until transparent and let cool. After tomatoes and jalapenos are roasted, place all ingredients in a blender (leaving tomatoes and jalapenos whole) and blend for about 15 seconds, taking care not to over blend or the mixture will be too watery. You may have to do this in several batches if you don't have a commercially sized blender. You can also vary the number of jalapenos or garlic to your taste. Ninfa Laurenzo sold the restaurants, agreeing to stay on as an advisor. She passed away several years ago. The original Ninfa’s were tops in mexican food in Houston. After the sell of the restaurants, the quality and taste went way down from the original. There are Ninfa’s in Houston, but they are no ‘Ninfa’ taste or quality from long ago. One of her sons started a restaurant ‘El Tiempo’ which features his mother’s original recipes. The food is delicious, just like Mom’s. My husband loves chips and salsa so I love to make him different recipes every once and awhile. He loved this one!